It's a Springbank Taste Off! Yesterday, I gave a little intro into the Campbeltown region and the Springbank Distillery. Today, I'll start reporting on this epic Taste Off. To review: though just a tiny town, Campbeltown was a serious whisky producer in the 1800s. A major downturn in the 1900s decimated over 90% of their distilleries. The strongest remaining producer of in the region is the Springbank distillery which makes a number of completely unique whisky brands, all separated by different distillation methods. One of these whisky brands is Hazelburn. 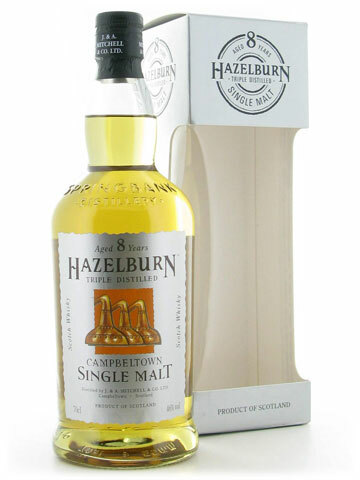 Named after one of the closed old distilleries, Hazelburn's distillation began in 1997, with the first bottling (8 years old) released in 2005. They've since added three other bottlings, but the 8 year old has been the most successful and the easiest one to find in The States. 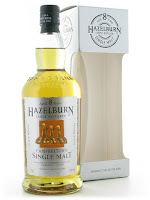 The Hazelburn whisky sets itself apart from the other Springbank brands by its distillation methods. Almost all scotch whisky is distilled twice. Only Irish whiskies and scotch malts from The Lowlands are malted three times. This third distillation creates a lighter smoother whisky. Hazelburn now also passes through this third distilling, and its malt is not peated, thus allowing it to be crafted in the Lowland style. I came by my dram of Hazelburn 8 year via Master of Malt's tremendous Drinks by the Dram samples. It's not available right now amongst their sample selection so I'm plenty happy that I was able to get it while it was there. It was a 3cL or 30mL-sized dram which works very well for this sort of tasting. This allowed me to compare and contrast these three very different whiskies. As you can tell by the bottle picture its color's very light, the lightest of the three whiskies. Almost Sauvignon Blanc light. Its nose was light, soft, full of confectioners' sugar, vanilla, cookie dough, and lemon. It was like the scent of a bakery in full swing. The texture mirrored the color, very light and soft. But the palate shifted gears away from the nose. It tasted of the sea, shellfish, and bread crusts. My notes read: "Like a light lunch in the sun by the bay." The finish was brief but very pleasant, soaked with the vanilla flavors from the bourbon casks. Then I added one tablespoon of water, bringing the ABV down to 35%. This caused everything to shift and change. On the nose, the bourbon influence took a back seat to the sherry casks. There was lots of anise to go with the sherry. It was less sugary and contained some mysterious similarity to the Springbank 10yr I was sampling. The palate was cream and cardboard, like the white cardboard bottoms on Hostess Cupcakes. The finish was "kind and lazy", full of unsweetened breakfast cereal flakes. Like Glenkinchie (a Lowland single malt) it's a light, polite dram. But its nosing and flavors are a bit different than the Lowlands I've tried. Less fruit, more malt and a curious seaside element that carries through the other Springbank brands that I tried. Tomorrow: Springbank 10yr 100 Proof!